It was a day of firsts on Sunday for the Cleveland Browns. The first win as a head coach for Mike Pettine; Brian Hoyer’s first win as starting quarterback since his ACL injury; the first win in a home opener since 2004. The most import first was the fact that, for the first time in a long time, the Browns looked like a real NFL team, providing hope that this year just may be different. 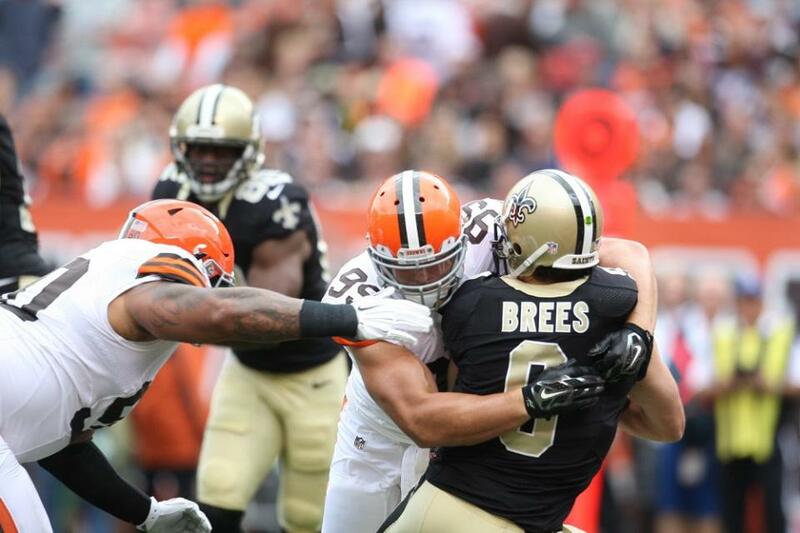 The defense was active for the second week in a row, with Paul Kruger getting the crowd into the game with a sack of Drew Brees on the Saints’ second possession of the game. Not only did it fire up the crowd, it helped calm the fears of the Fox announcing duo of Kenny Albert and Darryl Johnson, who were far too preoccupied with the fact that the Browns won the coin toss but elected to defer. Apparently they are the first team in NFL history to do this. Kruger also played a key role in Tashaun Gibson returning an interception for a touchdown in the second quarter as it was Kruger’s pressure that forced a high throw from Brees. On the offensive side, the game-winning drive that Hoyer led is one that should solidify his hold on the starting job, will have fans talking for weeks and may signal that this team is growing up before our eyes. Watching the drive as it unfolded it seemed simultaneously awesome and horrific. Taking over on his own four-yard line, Hoyer led a 14-play, 85-yard drive that appeared, at times, as slow moving and disjointed as anything we saw from Brandon Weeden or Jason Campbell. But looking back, it turns out that Hoyer was eight-of-11 on the final drive, completed a pair of third-down throws, a fourth-down throw and hit on four of his final five pass attempts. “To be able to have the poise to hang in there and find open guys when chaos is all around you and the crowd’s going crazy and time’s winding down, it’s a testament to [Hoyer] and his professionalism,” said wide receiver Miles Austin, who caught a touchdown pass. He also didn’t get rattled – even when he was sacked on the game-winning drive – and once again spread the ball around, completing passes to eight different receivers this week. Most importantly, Hoyer didn’t turn the ball over and has now thrown 139 passes without an interception, a streak that dates back to the third quarter of last year’s game against Minnesota. It wasn’t a perfect game, of course, as the defense struggled against Saints tight end Jimmy Graham (who doesn’t?) and at one point gave up touchdowns on three consecutive series. And Hoyer seems to be struggling to adjust to throwing to a group of short wide receivers in Andrew Hawkins, Taylor Gabriel and Travis Benjamin as several of his passes were high on Sunday. For today, though, none of that matters because the Browns won, sending the home fans – who so desperately want this team to reward their loyalty – out the doors with visions of beating up on the Baltimore Ravens next week dancing in their heads. Speaking of the Ravens, the Browns need to continue to build off their past six quarters of play and carry that momentum into the game with Baltimore. The worse thing that could happen right now is for the Browns to come out on Sunday and bumble their way through the game with the Ravens. With the bye week following the Baltimore game, it would be only too easy to have the enthusiasm wiped away with an ugly game on Sunday. “Handling success is important,” Pettine on Monday. “They need to understand the praise. Just like I said last week, we don’t want one loss to turn into two. We don’t want a big win … we don’t want to celebrate it for too long and have it turn into a loss. I think our guys, now that they’ve seen it, realize it. We have to be able to lock it away, take what we need to take from it, but then move onto the next one. It was a big day of firsts for the Browns on Sunday. Let’s hope we don’t have to wait very long for this feeling to return.